I just came across this really cute Easter garland while perusing the blogs tonight. 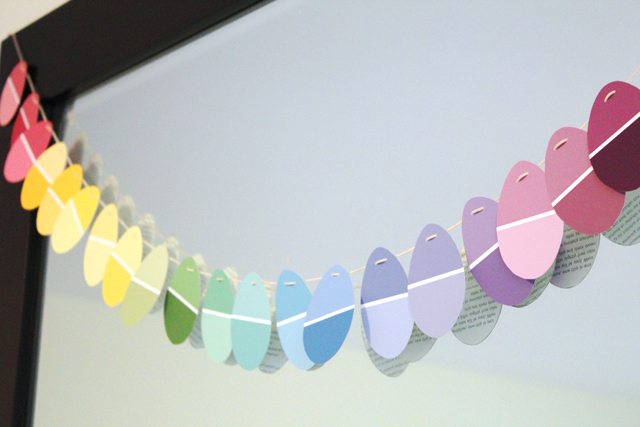 How about two tone Easter eggs made out of paint chips?! This great idea is from Modern Parents Messy Kids and you can see how to make it here. I love how colorful it is and that fact that paint chips are FREE. what a cute idea!! We've done something similar at Christmas before - cutting mitten shapes out of holiday card fronts and making a garland out of those.